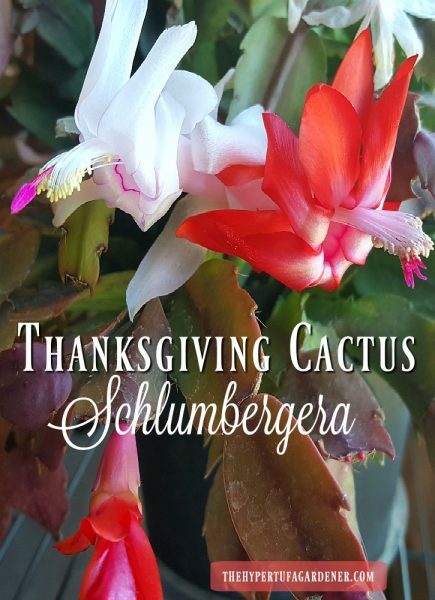 Schlumbergera – My Thanksgiving Cactus is Blooming! Red and White – Works for Me! 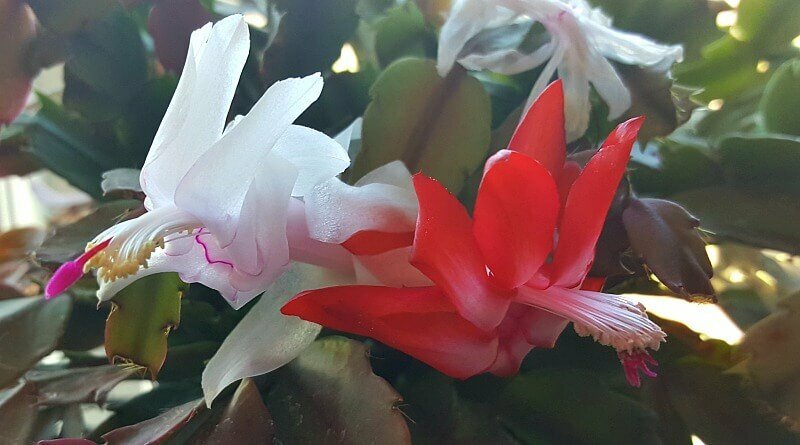 I have a pot of Red and White blooming Schlumbergera which I am afraid is going through an identity crisis. 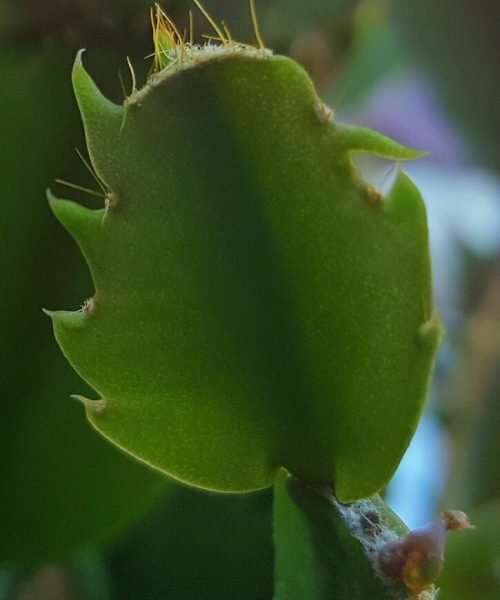 When you break it down, she most closely resembles what should be identified as a Thanksgiving Cactus since she has the jagged or toothed stem. But here is where the problem lies. She blooms at Easter and even Halloween and now that it is Thanksgiving, she is popping out quite a few blossoms. But I like her no matter what she is. Now here is a closeup of other stems in the same pot. 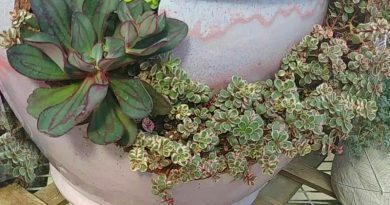 I do have more than one plant in this pot but most of the stems are the jagged type. But some are smoother which are more likely the “bridgesii” variety which is the Christmas variety. In reality it gets too confusing so we have a generic Holiday Cactus to also use for its name. What do you think? 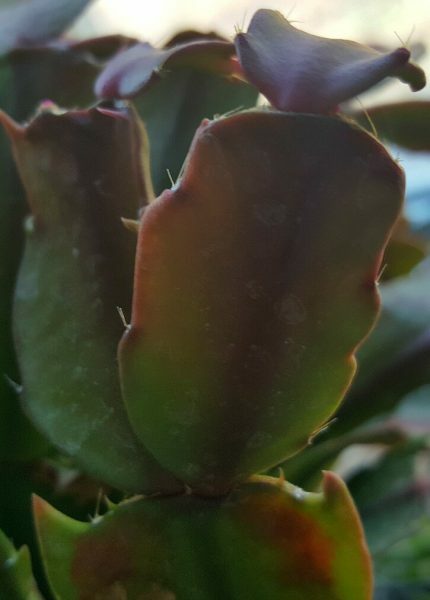 Do you see its underlying stem with the jagged teeth? Maybe mine is a hybrid of both. 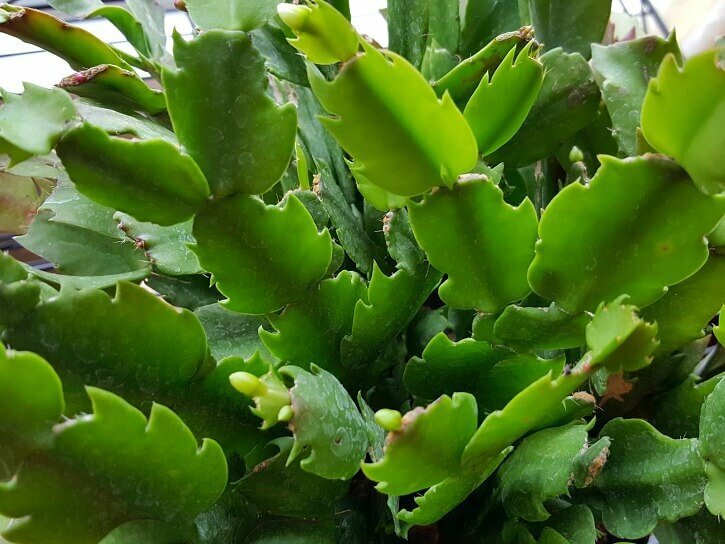 According to Wikipedia, the Schlumbergera is a native of Brazil and grows on trees or rocks. These plants have ” bristles and wool where the flower buds appear” and I think you can clearly see that in some of my photos. Flowers on these cacti are really large and very pretty. They remind me of the flowers on a fuschia plant. I have had a few of those but usually manage to kill them pretty quickly. 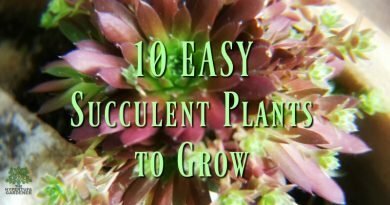 Gardeners naturally like to share plants and these plants are easy to share as gifts. If you break off a stem, it can be rooted easily. And we all know that succulents root best when they are allowed to callous at the breaking point. So if you wrap a cutting in a tissue to take it home with you, it shouldn’t be a problem to root it a day or two later. If I found a cutting even a week or two later, I would still put it in some gritty soil mix and try anyway. What have you got to lose? 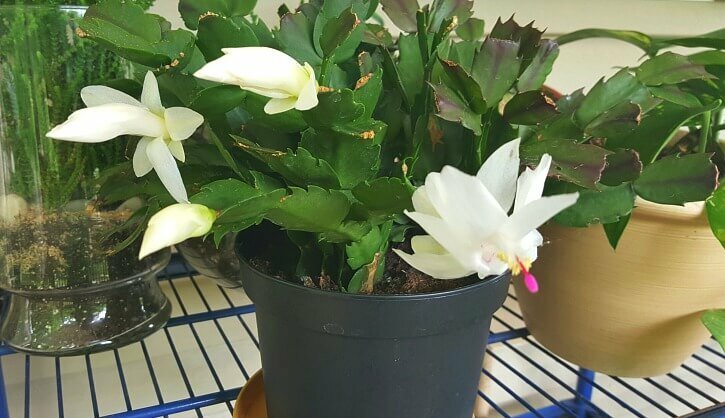 Many people have a Christmas cactus or Thanksgiving cactus that belonged to their grandmother or some family member that they have grown for 40 years etc. Now that would truly be a wonderful heirloom to display at Christmas, wouldn’t it? As I have gotten older, I just let nature takes its course. My plants summer out on the deck. I keep them under the roof so they don’t get the full burning rays of the sun but they do get a lot of light. After it gets late in the year here in Ohio, I give them the gnat treatment before I bring the pot inside. I have an unused bedroom for my plants to spend the winter and it has a south-facing large window. I have shelves in there and put my plants on these shelves over the winter. I water the plant and then ignore it for a while because I am so busy getting everything else in and cleaning up the garden. Without doing anything special, I just go in the find that the plant has buds all over it and I am about to become a “Cactus Grandma” again. It either blooms or it doesn’t and I don’t have time to fuss over it. So you can see. I am rewarded this year. I think she is nice because she doesn’t want to be put into a dark closet either. Can you blame her? 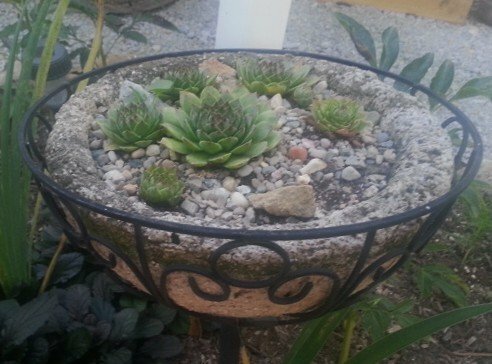 Succulent Arrangements – Such Inspirations!